Varley made his first tour to North Wales in 1798 or 1799 along with the landscape painter George Arnald. The route in North Wales is not recorded, but was probably the route proposed in the guidebooks of the time, namely Chirk and Llangollen to Capel Curig, on to Bangor and along the coast to Conway, then back to LLanrwst and Capel Curig, on foot through the Pass of Llanberis to Caernarvon, then South to Beddgelert, Harlech, Barmouth, Dolgelly, then up Cader Idris, Tal-y-llyn, back to Dolgelly, Bala and the border. All these places were painted by Varley and remained in his repetoire. 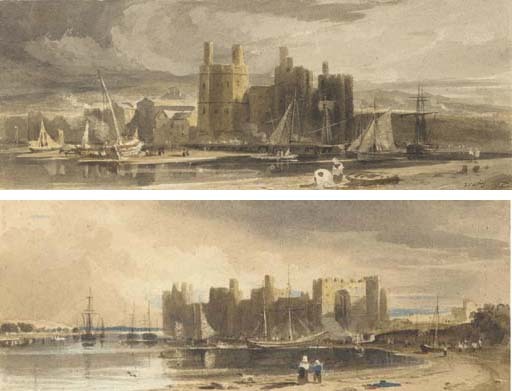 Varley exhibited views of Caernarvon Castle at the Old Water-Colour Society in 1810, no. 32 and in 1812, no. 286.